Recently, a traveling exhibit called 'The Jim Henson Exhibition: Imagination Unlimited' opened in Los Angeles, California. It can be seen at the Skirball Cultural Center. 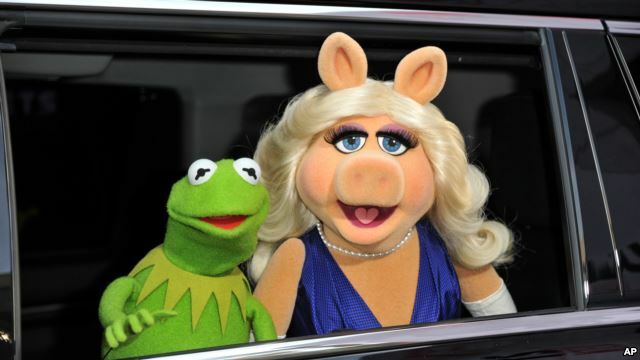 Visitors are able to take a close look at some of the most beloved Muppets, including Kermit the Frog, Miss Piggy and The Count. The exhibit helps to show what is required to bring them to life. 'If you learn from Sesame Street, he (The Count) teaches you how to count. There's Cookie Monster, he does the ABCs every episode,' said 9-year-old Elli Fire. She spoke to VOA during her visit to the Skirball Cultural Center. 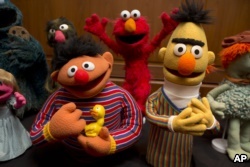 Bert and Ernie, as well as Elmo, center, are among a donation of additional Jim Henson objects to the Smithsonian's National Museum of American History in Washington, Sept. 24, 2013. 'You can see original sketches, actually notes of the very beginnings of ideas all the way through to finished puppets,' said Lisa Henson. Elizabeth Lee wrote this story for VOANews.com. Phil Dierking adapted the story for Learning English. George Grow was the editor. Do you think puppets are still popular with people? Write to us in the Comments Section or on our Facebook page.